Several years ago, images of a pair of antebellum portraits arrived in my inbox: William Franklin Dunnica and Mary Jane Shackelford (Mrs. William F. Dunnica). I knew instantly that George Caleb Bingham was the artist. But, as a professional art investigator, I knew the accuracy of a “blink” moment always needs to be tested. The Dunnica portraits are reproduced here in black & white due to the potential for misuse. The colors are vibrant. The artist gave each dark-haired, dark-eyed subject color on their cheeks, just as George Caleb Bingham did. On Mr. Dunnica’s cheeks and under his nose, the artist suggested the slightest hint of a beard, just as Bingham did. In the portrait of Martha Jane Dunnica a blush red shawl subtly complements the deep green of her dress. White lace hides her cleavage. A long strand of coral beads adorns her neck. The background of green /brown with golden highlights is the typical shade used by Bingham. The logical starting point for researching the authenticity of the portraits was, and is, E. Maurice Bloch’s Paintings of George Caleb Bingham: A Catalogue Raisonné. From hours of poring over Bloch’s definitive text and from a previous portrait search, I knew the name “Dunnica,” but I did not remember these two paintings. I found them listed in the book’s back pages in Section D., “Attributed Paintings.” The scholarly community nearly universally dismisses the paintings Bloch placed in Section D.
To prove or disprove the heirloom portraits’ authenticity with verifiable certainty would require time. Both the portraits’ owner and I had other priorities, but last year, the heirlooms became a top priority for each of us. I set to work. This is the first of four blogs about the adventure. The first two describe the process of authentication, beginning here with art historical documentation and continuing to connoisseurship in the second blog. The third explains how these two fine portraits ended up in the “trash bin” of the George Caleb Bingham Catalogue Raisonné. In the fourth and final blog, I use the portraits as an entry point to history and tell the stories I discovered behind the portraits. The true tales include a Civil War battle and confrontations with Bloody Bill Anderson and William Quantrill. The chain of custody was indisputable. Through primary source documents, I followed the subjects’ descendants as they moved from Missouri to another state and then across continents. The documents breathed life into the family’s history as the portraits descended within the family from one generation to the next. Comparisons of the portraits with fashion plates and other dated portraits indicated that an artist painted the likenesses between 1836 and 1839. An accurate portrait authentication requires proof that the subjects and artist were in the same region at the indicated time. In 1836-1839, William Franklin Dunnica and his first wife, Martha Jane Shackelford, lived in the town of Chariton, Missouri, now known as the the town of Glasgow. In 1838, J. Calvin Smith, of the J.H. Colton & Co., drew a map of Missouri. In an enlarged detail of that map below, Chariton, Missouri, can be seen near the center. At a bend in the Missouri River, its name is written above the name of its county, Howard. George Caleb Bingham’s home in Arrow Rock lay less than 20 miles southwest on the other side of the river, under the name of its county, Saline. 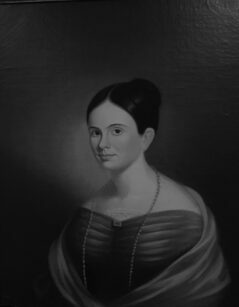 Martha Jane Shackelford was born on February 25, 1820, in Nashville, Tennessee, the daughter of Thomas Shackelford and Eliza Cheves Pulliam. On December 11, 1836, when she was 16, she married William Franklin Dunnica, 29. William then opened a store at the mouth of the Chariton river. Collier financed the enterprise while Dunnica was in charge of operations. Three years later, W. F. Dunnica was one of the founders of Chariton, Missouri. He married 16-year-old Martha Jane Shackelford on December 11, 1836. As a shopkeeper, Dunnica owned few slaves. To build a home on hilltop overlooking Chariton for his bride and himself, he would have rented more or hired a contractor. The newlyweds named their home Dunhaven. With quarters for their five slaves, outbuildings, and a conservatory, the estate covered an entire city block. The walls of such a home called out for portraits of the owners. For further biographical information on William F. Dunnica, including his roles in the Mormon War, the Battle of Glasgow, and an encounter with Quantrill’s Raiders and Bloody Bill Anderson, click here. The logical choice for a portrait artist for the Dunnnicas would have been George Caleb Bingham, the only local artist during the years 1836-1839. Moreover, the circumstances of the lives of the Binghams and the Dunnicas solidified the conclusion. On April 14, 1836, in Boonville, Missouri, eight months before the Dunnicas wed, George Caleb Bingham (1811-1879) married Sarah Elizabeth Hutchison (1819-1848). He was 25, and she, 17. They soon moved to St. Louis, Missouri, where Bingham opened a studio. Through exposure to art and to other painters, the young, self-taught artist from the western frontier improved his technique. As winter approached, about the time of the Dunnica wedding, George and Sarah, pregnant with their first child, traveled down the Mississippi River to Natchez, Mississippi. Natchez was a popular winter haven in the nation’s antebellum years for those who could afford to escape the cold weather of states further north – and who could afford and had the leisure to sit for a portrait. Many artists traveled to Natchez and other such resorts in search of portrait commissions. Bingham, rarely one to pass up an opportunity, followed the trend. On March 26, 1837, Isaac Newton Bingham was born in the Mississippi riverfront town. 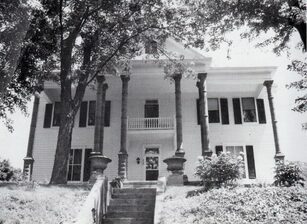 By May, the Binghams had returned to Missouri with their newborn son, this time to Columbia, where George rented a studio above the law offices of a young attorney, James Sidney Rollins. Art historical documentation pointed at George Caleb Bingham as the artist of the Dunnica portraits. In the next blog, I explore the third leg of authenticity or the heirloom paintings: Connoisseurship. 1817 – Ferguson’s Description of Cote Sans Dessein, “The World of Hannah Chribbs Evans, https://chribbs.wordpress.com/, accessed March 2018; O. P. Williams. & Co., History of Howard and Cooper Counties, Missouri (National Historical Company. 1883), 437. Dunhaven is currently the oldest structure in Glasgow, Missouri, according to James H Steele., ed., Howard County MO: From Prairie Land to Promised Land, A Remembrance Across Two Centuries (Donning Company. 2016), 136; United States Census Bureau, Sixth Census of the United States, “Household of W. F. Dunican,” 1840, Chariton, Howard, Missouri, page 44, line 15. Friends of the Lewis Library of Glasgow [Missouri], Glasgow – The Way It Was (Walsworth Publishing Company, 2001), 134. 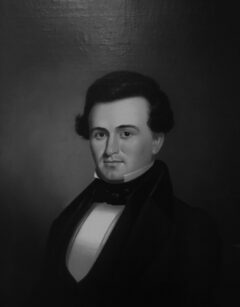 Bingham purchased the lot from Meredith Miles Marmaduke (1791-1864), who would become the eighth governor of Missouri (1844-1844). Williams, 206. I list 16, although J. Y. Miller, Glasgow, Missouri, historian, helpfully fact-checked this manuscript. He noted that although the number of founders is sometimes listed as 14, the actual number was 16. But, because three of those men, Pulliam, Johnson, and Moore, soon became inactive as landowners, the people of Glasgow count the number of founders as 13. George Caleb Bingham’s portraits of John Fontaine Nicolds (Bloch #60) and Elizabeth Morton Woodson (Mrs. John Fontaine Nicholds) (#61) and John Hickman Turner (#101) are currently unlocated. Please notify Fine Art Investigations if you know, or have a clue, to their current location. This entry was posted in Rediscovered George Caleb Bingham Portrait and tagged Chariton, George Caleb Bingham, Glasgow, Martha Jane Dunnica, Martha Jane Shackelford, Missouri, William Dunnica. Bookmark the permalink.